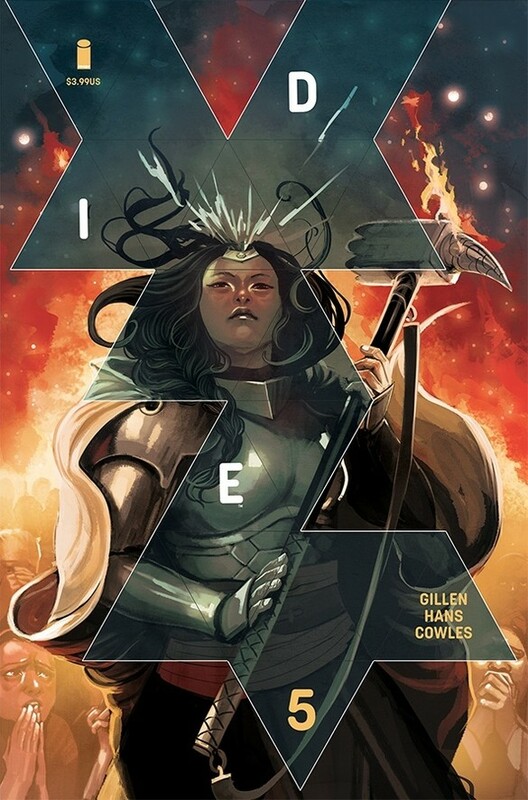 Die #5 review: The ultimate buy-in – AiPT! Die from Image Comics has been an emotional ride that seems to get better with each issue. The series is consistently well written, looks amazing, and is heartbreaking. As the first arc comes to an end, the players have tough decisions to make. How far will they go to return home and what can they do to convince an entire town they have the best idea? Kieron Gillen writes another moving issue. One reason Die so easily affects readers is how deep each character is; every member of Gillen’s party has had time to develop. What makes this development even better is that the series isn’t just a series of one shots devoted to a character. Instead, we have seen each one progress with the story. Every decision they make or action they undertake makes sense since they have been an integral part of every issue. Nowhere is this more apparent than in the finale of issue #5. Just when it seems like things are going to end much too easily, characters start making the decisions readers expect. The writing here is spectacular since when twist happens, it’s a huge surprise. It really seemed like everyone was on the same page, especially after the actions of the issue. Yet, when it happens, it also makes sense. The characters do the unexpected, but it’s also not surprising. This adds to the emotion of the book. Though it has only been five issues, it is hard to not root for the unexpected players to attain their goals. When everything seems so close, it’s impossible not to get mad. The entire issue is especially emotional since the five have to essentially become monsters to return home. The whole book is difficult to read. From Ash using her powers to Angela’s part in the plan, each person plays a huge part. It’s very scary how quickly they all became a part of the game and adds to the bleakness of the entire series. Previous issues of Die have ended on a very strong note. Issue #5 is no different, ending on a statement that punctuates the horrific acts that have just been committed. The moments leading up to it were actually somewhat anticlimactic, however. Maybe it was because things seemed a little too easy, or it may have been the Grandmaster himself. From some reason, it came off a little flat. That being said, the confrontation between Ash and the Grandmaster is a highlight of the entire series. Every issue, the art of Stephanie Hans looks great, but the final page of the fifth issue is especially powerful. Many times, readers will look at a page and think how great or beautiful it looks. This one is moving and will cause an emotional reaction. Throughout the issue, the work of Hans is on display. The Grandmaster looks absolutely frightening. Our first real glance inside Eternal Prussia is a terrifying one. The climactic battle includes some of the best drawn pages of the entire series. Die is a great book just to look at. Die ends its first arc on a very strong note. Never content to rest on its laurels, the series became increasingly powerful with each issue. The writing will keep readers entranced while the art is beautiful and works with the setting perfectly. Die is a must read series in every sense of the term.